“But, it all paid off when I received that phone call that changed my life forever.” -Valentino K.
2014, the year that I will call, “The Year of Opportunity”, has unequivocally been the best year of my life. This year has taught me that with hard work and devotion, success is possible, and that I have the potential to persevere through insurmountable odds. My senior year is going as anticipated. I have been working conscientiously to combat “senioritis” and am continuing to perform well academically. The first semester flew by and now there is only one remaining before I walk across that stage and accept my diploma, an endeavor that so many anxiously work to achieve. Even though that day is rapidly approaching, I must continue to keep my eye on the prize and not let the epidemic of “senioritis” act as a hindrance in my educational sphere. I have been presented with many arduous tasks, but Student Government has unquestionably been the most demanding. We are responsible for hosting programs, sponsoring community service events, providing support to the student clubs and organizations, and most importantly, enhancing the student life. Being SGA President has strengthened my leadership abilities, and has showed me how to collaborate with others to reach our common goals! In addition to taking some of the most rigorous classes in my school’s curriculum this year, I also had to work on college applications. College Apps have pushed me beyond what I thought I was capable of. It truly made me understand the definition of “what it takes to get into college” –relentlessly writing essays, obtaining recommendations, sending transcripts, attending interviews, continuing to do well academically, all while engaging in constant battles with “senioritis”. But, it all paid off when I received that phone call that changed my life forever. 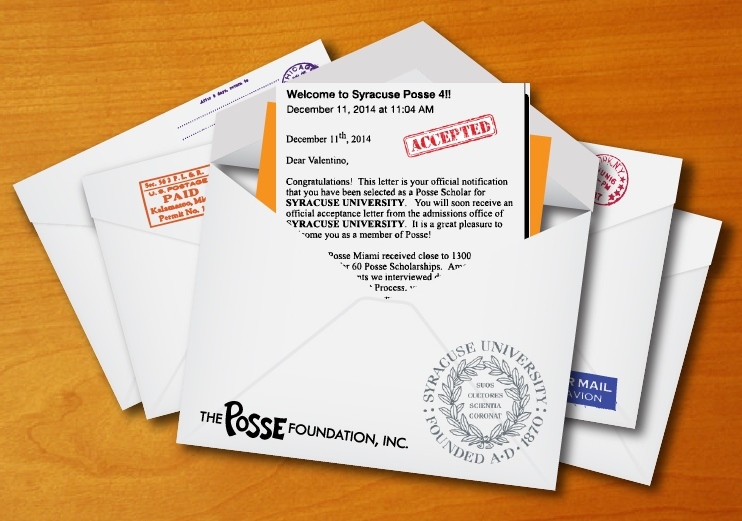 With the support and guidance of my amazing mentor and many individuals who have profoundly impacted my life, coupled with my self-determination to prosper in life, I am now a Posse Scholar for Syracuse University. There were over 1,300 state-wide and over 15,000 nation-wide nominations. I am humbled and honored to have been granted this prestigious award. I will be joining a phenomenally impressive group of young students who have made a visible difference at the school and in their professional careers. It has been a difficult journey getting here, but I have triumphantly made it through. All in all, 2014 has shaped me in ways I would never have imagined. I’m thinking bigger, and better, than ever before! I’m thrilled for you, Valentino! Excellent work. Syracuse is a beautiful campus! Start stocking up on warm clothes.